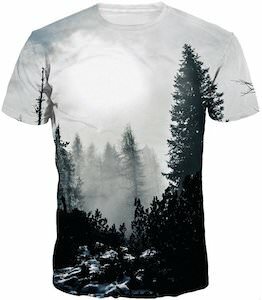 If you like to be in a forest or just surrounded by trees then wearing this t-shirt is what you want to do. The unisex t-shirt is available in many sizes and is made from 88% polyester and 12 % spandex and will just feel amazing on your skin. The t-shirt is covered all over the front, back and even the sleeves with a black and white image of trees and a landscape and that nature scene will look amazing on both men and women. It is a unique design that just makes you want to go outside and hang out with the trees in the forest. Do you like running in nature? If so did you ever see some trees running with your because this fun t-shirt shows running trees and the text “Run Forest, Run!”. Of course the forest should be ready to run because you never know when they cut those beautiful trees. 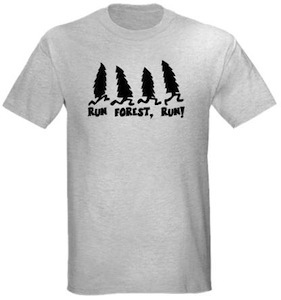 Now you can have your own Run Forest, Run t-shirt in all kind of colors and styles. Get your Run Forest, Run! Posted on June 20, 2012 March 8, 2016 Author GeorgeTags forest, men's, running, tree, Women'sLeave a comment on Run Forest, Run!